Marijuana, also known as cannabis, is made from the dried leaves and flowers of the hemp plant, Cannabis sativa. The plant grows in many tropical climates; however, nowadays it can be cultivated by means of indoor technologies almost everywhere in the world. The main active ingredient of cannabis is delta-9-tetrahydro-cannabinol, commonly known as THC. The federal law regarding marijuana in the U.S. allows state legislators to decide for themselves whether to prohibit marijuana or not. Many state authorities in the U.S. have allowed marijuana for medical use. In addition, more administrative districts are legalizing marijuana for recreational usage. As of 2018, there are nine states plus the District of Columbia in the U.S. in which the recreational use of marijuana is legal or the legalization is planned to be approved soon: Alaska, California, Colorado, Maine, Massachusetts, Nevada, Oregon, Washington, and Vermont. The retail sales of cannabis for recreational use have grown considerably since 2014, amounting to about 4.4 billion U.S. dollars in 2018. The leading market in terms of overall cannabis sales is California, with sales of about 5.6 billion U.S. dollars in 2018. Marijuana is the least potent of all the cannabis products and is often smoked in hand-rolled cigarettes. As of 2016, it remains the most popular cannabis product, with over 54 percent of the market value. However, with the advent of legal marijuana, there has been an explosion of marijuana derivatives available on the market, from concentrated oils to topical creams. One of the most popular alternatives to smoking is edible marijuana. However, as of 2016, marijuana flowers still had the highest share of the cannabis market. 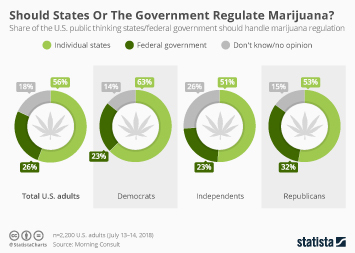 Public opinion on legal marijuana in the United States has changed drastically since the early 2000s. Although marijuana use has long been considered a sign of delinquent behavior and socially objectionable, a survey conducted in October 2017 found that about 64 percent of Americans believed that marijuana should be legalized, a sign of the changing times. As of 2017, about 123 million Americans claimed to have used marijuana at some point in their lifetime, or about one in three Americans. Among U.S. adults, the most common reasons for using marijuana are for relaxation, stress relief, and to better enjoy social experiences. Cannabis sales for recreational use in the U.S.